IMPORTANT NOTE: Lunatic Astronomical hi-torque, gear-reduced stepper motors are installed on all motorized Zerotators (ZBR2). You need to order a Seletek controller (Armadillo, Platypus, etc. ), from Lunatic Astronomical (LA) to control your motorized Zerotator. Seletek controllers offer independent multi-device ASCOM control platforms (i.e. 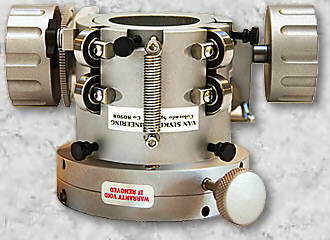 focuser, filter wheel, rotator, etc.). Seletek controllers can drive other vendor's motors too (i.e. Robo-Focus, Moonlite, Feather Touch, etc.). For details, plus LA contact info, and click on AUTOFOCUS link. Profile: manual = 0.85", motorized = 1.3"
Weight: manual = 1 lb., motorized = 2 lbs. VSI's manual Zerotator is now available in a motorized model. There is no physical difference between the manual (see section below) or motorized Zerotator's housing body. The NEW 80 internal needle bearings are the same on both models. They are both designed to operate with the shortest profile mechanically and physically possible, while providing a load bearing capacity second to none. The motorized model consumes a mere 1.3" of profile. 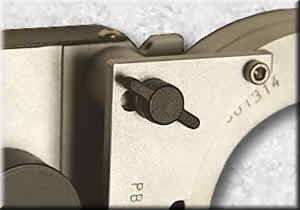 0.45" of that profile is consumed by the removable gear ring insert (shown best in the profile picture at right). This insertable gear ring is similar to VSI's interchangeable port rings. This NEW higher-torque Lunatic gear-reduced stepper motor will easily drive/rotate any leveraged load you could possibly attach to the Zerotator. I personally tried to stop this new high-torque drive motor by grasping the Zerotator's large-diameter spur gear with all my strength. I could not even cause the motor to "grunt." For those who require empirical data, I calculated that the rotational torque of the Zerotator exceeds 100 in/lbs. That's pounds, not ounces. The motor drive train offers a large-diameter stainless steel (SS) spur gear (shown in both pictures) and a multi-gear reduction train using Delrin spur gears. This unique polymer gear material combination provides an isolation barrier, dampening motor vibrations from entering your imaging train. And Delrin gears have been proven to outlast metal gears many times over. A spur gear direct drive system is far superior to rubber cog belts and pulleys. As a record to date (25 years), I have never used belt drive systems on any of my products. Rubber cog belts and pulleys always have inherent play and backlash that is not removable, no matter how much you tension the belt. I've always felt that rubber-band drives are for toys. A positive action spur gear drive is always the best choice to create a zero-backlash, positive drive mechanism, even though it comes at a higher cost. Don't misunderstand, there are many viable applications for rubber cog belt drives, just not at VSI. The Zerotator's ultra-high torque stepper motors (pictured at right) have been specifically designed by Lunatic Astronomical (LA) for VSI motorized Zerotators. Although these special motors are from a different manufacturer than the ones that operate VSI Toad focusers, they incorporate the same DB9 jack and are operated by LA Seletek ASCOM controllers (Armadillo & Platypus). You may have noticed that this motor looks like others but has much higher torque capabilities. Infact, it has the highest torque in its class by a large factor. As you may, or may not know, if a VSI product is motorized (focusers, etc. ), it will always have an instant disconnect mechanism. The only exception are VSI spiders, because they are a completely different "animal." There are many dysfunctional products on the market that connect a drive motor's shaft directly to the product's drive mechanism, with no means of disconnect. This is never done at VSI. The motorized Zerotator has an instant disengage/engage capability that is simple and easy to use. Just loosen the quarter-turn thumb screw (pictured at left) to disengage/engage the Delrin drive gear from the large-diameter SS spur gear. With the gear mechanism disengaged, you can manually rotate your imaging train to any position you desire. Or simply use the Zerotator manually if need be. Fast, easy and efficient. Did I say simple? Using the various flanged port rings (listed bottom of this page), you can connect anything to anything and only consume about 1/8" of additional profile per port ring. These combinations will allow you to construct any conceivable configuration using VSI's huge selection of port rings and adapters available for VSI's 2.9" proprietary format (Zerotator, Sidewinder & Targetron). If you acquire/install a new scope, new camera, new imaging train configuration - no problem. VSI's myriad of port rings are always available to accommodate your every need. VSI Zerotators are designed to operate with the shortest profile mechanically and physically possible, while providing a load bearing capacity second to none. 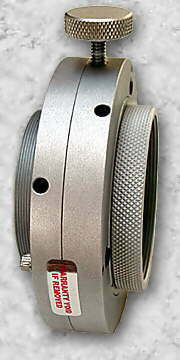 You can use your Zerotator as a simple, low-profile, male/female threaded coupling (left, shown with optional port rings), or with any other combination of port rings (listed below and pictured at the SIDEWINDER and TARGETRON PORT RINGS links). Using the various flanged port rings, you can connect anything to anything and only consume about 1/8" of additional profile. You can construct any conceivable configuration with the myriad of port rings and adapters available for VSI's 2.9" proprietary format. Note the 3" ToadLoader, Zerotator and Sidewinder coupled together (see picture at right) creating an ultra-low profile combination with a huge 2.75" internal clear aperture. Also note the 2" ToadLoader (below left) with the Zerotator attached to the input (bottom) of the focuser (not the 2" output at the top). 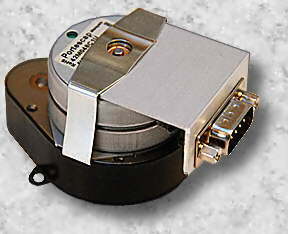 Although either method on the 2" focuser below is mechanically posssible, the pictured installation provides more rigidity without reducing the Zerotator's large 2.75" internal clear aperture with 2" format reducer/adapters which cause vignetting. The Sidewinder, Targetron, and Zerotator use the same 2.9" coupling format providing extreme interchangeability, like no other. Using just two Coupling Port Rings you can create the shortest profile, largest internal clear aperture, most rock-solid imaging train on Planet Earth. No one else even comes close to offering the connect-ability of VSI, period! If you can't create your dream imaging train with [off-the-shelf] port rings, then contact VSI to create custom machined port rings that will do exactly what you want. And your custom machined port rings will ship on our next shipping date, just like our "off-the-shelf" ones. Why would you want a dedicated rotator for your focuser, diagonal, optical manifold or your entire imaging train? Many reasons exist. The main reason would be to rotate your imaging train to acquire a suitable guide star for astroimaging (see picture above far left). Another would be setting the position angle of a double star to determine their separation. And another would be proper orientation of your image with north toward the top. 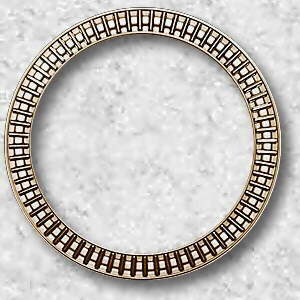 COMMENTARY: The Zerotator may look like a simple ring, but it is far from simple. The tolerances and flexure are zero, meaning that it takes a lot of meticulous effort and time to create this internally rigid and accurate [80 needle bearing] mechanism. Hand fitting and lapping each matched set of rings, with individually marked numbering, is not even conceived in mass-production manufacturing. 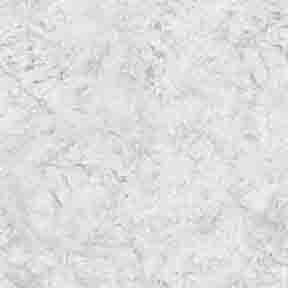 It is very frustrating [to me] when people, who are unfamiliar with VSI products, call to ask why a product is so "expensive." On the contrary, all products are very reasonably priced, considering they are guaranteed to have zero tolerance and flexure under any load. And, to date, all of these people who complain, have never had a VSI product in hand. No one, who has ever experienced a VSI product, has ever had anything but high praise, and maybe a little guilt for taking advantage of my low wholesale pricing. 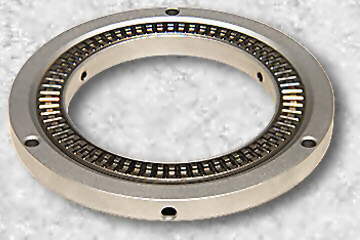 Pictured at left is the inside of the Zerotator's rear disk, showing the 80 caged needle bearings that the inner ring (not shown) rotates against. 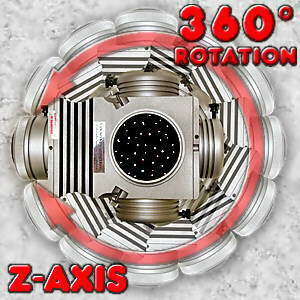 This NEW design offers zero flexure with extremely heavy, extended imaging train loads that no other rotator can offer. The Zerotator offers an internal clear aperture of 2.9 inches, which is slightly reduced depending on the inserted port rings required to install your components. 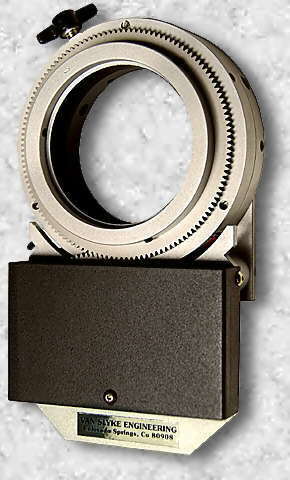 Typically, with PORT RINGS inserted in both sides of the Zerotator, the internal clear aperture would be around 2.75 inches. And, since port rings are installed within the actual profile of the Zerotator itself, profile of the port rings is minimal. Therefore, the average threaded port ring's shoulder consumes less than 0.1" of real profile (not including the threaded profile of the port ring, which is overlapped and cancelled by your existing male or female threads). At right is a picture of the Zerotator from the side, without port rings installed, illustrating its extremely short base profile of 0.85" without the motorized addition. This is achieved by using all the mechanical tricks in the book, like recessed set screws, noted by the two [shown] holes in the Zerotator's housing. There are actually three holes, opposed by 120 degrees, on each side of the Zerotator, six total. Inserting an Allen wrench in these holes, to turn a set screw, installs or removes the 2.9" flanged port rings. This recessed set screw design is also used on the Targetron to achieve its super short profile of 1.5 inches, which is the shortest profile of any off-axis guider available, by a large factor. 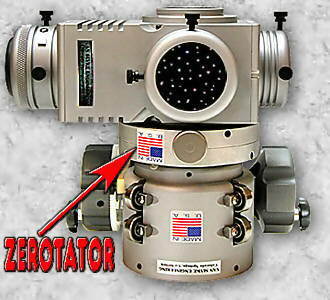 The Zerotator can also claim the same [lowest-profile] distinction in the rotator market, by a much larger factor. You can also [easily] adjust the Zerotator's rotational tensioning by simply adjusting three large set screws on the face plate (not shown). This feature is especially useful when you have an off-axis load. Instead of continuously tightening and loosening a manual thumb screw, just set the tensioning screws to stabilize the rotation of the off-axis load. Again, the Zerotator is just what its name implies - Z-axis rotation with Zero-Flexure achieved by Zero tolerance machining. And this claim is guaranteed, under any load. 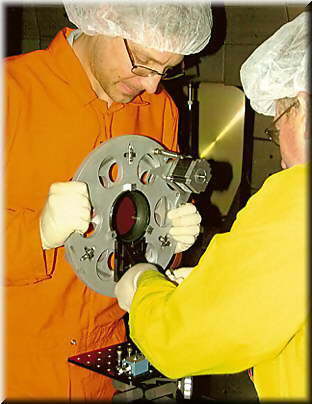 The above motorized VSI Crayford Disk Rotator was used for non-astronomical applications by Lawrence Livermore National Labs at General Atomics. Click on the picture to find out more about their special application for a VSI Cycloid Rotator (now discontinued).